When Notre Dame renews its storied rivalry with the Miami Hurricanes Saturday night in Chicago’s Soldier Field, it will happen within the hallowed confines of a site that has seen its own iconic place in Notre Dame football history. It will be only the 12th Notre Dame game to take place at the landmark lakefront stadium, but the previous 11 include some of the most well-attended and classic matchups in college football history. The Irish are unbeaten at Soldier Field, with a mark of 9-0-2. Eight of the games took place between 1924 and 1931, as college football’s – and Notre Dame’s – burgeoning popularity drew massive crowds of the well-off alongside the lunch-bucket brigade. The finishing touches on Grant Park stadium in 1924. 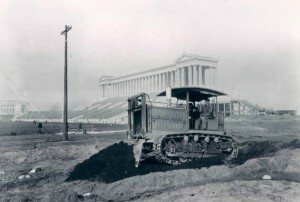 One of the crowning jewels for Chicago was the opening of the new $5-million Grant Park stadium, along the lakeshore south of the “loop district.” Designed by Holabird and Roche, its Classical Revival style used the Greek Doric order, the most distinctive feature being a pair of systole colonnades along the east and west sides. Each colonnade, flanked by tetra style templates, was built with a double row of 32 columns. The great edifice was declared ready to use in late summer, with about 35,000 seats completed and construction on seating sections continuing. On September 6 and 7, the stadium was dedicated when crowds of 45,000 and 50,000 gathered for the annual Chicago Police Department track and field meet. In the coming weeks, the stadium would host a great variety of civic events, from a children’s parade circus to the Chicago Day program, when men of Troop A of the Fourteenth Cavalry charged with their horses through rings of fire. The first football game at the mammoth new field was the 1924 Public League High School championship game. Then, on Armistice Day, the “Catholic college championship of the Midwest” was contested between Columbia College of Dubuque, Iowa, coached by ex-Irish star Eddie Anderson, and St. Viator of Bourbonnais, Illinois, a frequent foe of Notre Dame reserve teams. A rainstorm turned the field into a mud hole, and the teams sloshed their way to a scoreless tie. The new stadium was as ready as it could be. During the week, Northwestern’s movable bleachers were installed at the north and south ends of the gridiron, adding several thousand seats to the site. Officials decided several thousand more could be admitted to standing room areas. Workmen also thickly dressed down the field with hay to protect the turf. On game day, though, the new field showed the effects of the recent snow and rain and was in poor condition. Players slipped and slid in pre-game warm-ups, while the heavily bundled crowd, many arriving at the stadium for the first time, struggled to find their seats. The game itself was a defensive tussle on what became a mudbath of a field. Tied 6-6 in the second half, ND got the winning score when Elmer Layden intercepted a pass and returned it 45 yards for a TD. Layden later left the game with an injury, and his famous mates were fortunate to close out the 13-6 victory, one of the closest calls in a perfect season that included lopsided wins against strong teams like Georgia Tech, Wisconsin and Nebraska. 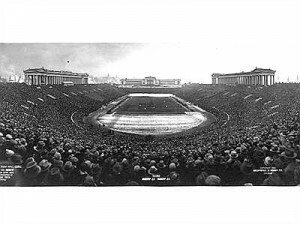 Three years later, Soldier Field hosted the second game of the ND-Southern Cal series, and first to be played in the Midwest, as a massive throng of 120,000 set the record for the largest crowd to watch a football game. It was the season-closer, on November 26, years before USC would request a trip to the Midwest earlier in the season. 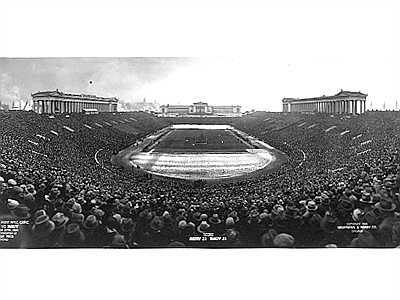 Crowds packed Soldier Field in the 1920s to see Notre Dame play. Notre Dame edged the Trojans, 7-6, in a game marked by controversy. Late in the fourth quarter, ND’s Charlie Riley fielded a USC punt near the Notre Dame goal line, bobbled the ball and crossed into the end zone, where he was hit hard, knocking the ball out of bounds. The officials ruled it a touchback. USC players and coaches stormed the field, insisting it should have been a safety and an 8-7 Trojan lead. Instead, ND won 7-6. The ’27 USC game also helped propel forward plans to built Notre Dame Stadium. Rockne had been lobbying university administrators for years that a replacement for rickety Cartier Field could help bring big-time opponents and large crowds to campus. In 1928, it was proven the previous year’s USC game was no fluke, as another estimated 120,000 – including a paid crowd of 103,081 – turned out for a 7-0 win over Navy. 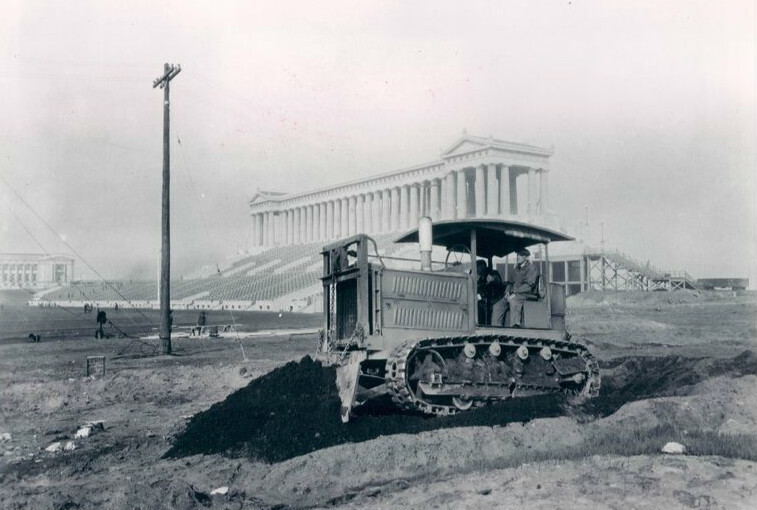 In 1929, as Notre Dame Stadium was being built, Soldier Field hosted three Irish victories, over Drake, Wisconsin and USC, en route to ND’s second consensus national championship. The USC game, on November 16, was like many that season in that Rockne, confined to a wheelchair or gurney due to severe phlebitis, played a limited role. With the scored tied 6-6 at the half, he was brought into the locker room and made a brief speech, after which Joe Savoldi scored the winning touchdown early in the second half. USC scored on a long run but missed the point-after, and the Irish escaped with an exciting 13-12 win. In 1930, the Irish breezed through their first eight opponents, playing five games at new Notre Dame Stadium, before the undefeated season came down to games against its two biggest rivals – Army and USC. The Irish had played Army 16 times since 1913, with the first nine games at West Point, then seven contests in New York City. But this time, with a long trip to the West Coast looming the following week, Notre Dame asked Army to visit the Midwest, so the Cadets traveled west for a November 29 game at Soldier Field. The crowd estimated at 110,000 – with 103,310 paid – was pelted with snow and rain under dark, low-hanging clouds. Yardage was at a premium, and the teams appeared headed toward a scoreless tie. Until, with less than six minutes left, Notre Dame executed what they called “the perfect play” in which a number of blocks were completed with exact precision, and the ball carrier Marchie Schwartz was escorted by end Tom Conley and fullback Moon Mullins on a 54-yard TD run. The conversion made it 7-0. But in the final minute, Army blocked a Notre Dame punt and recovered in the end zone for a TD. Army’s extra point attempt was described this way in The Big Game: “Notre Dame sets up a nine-man line against the conversion attempt and the forwards crouch for the savage lunge…A frail, blond kid named Chuck Broshous stands bare-headed on the 12 yard line, arms outstretched, waiting to drop-kick. He has wiped the ball with his sweatshirt to improve his chances. He opens his hands as a signal for the snap and the line meet. The ball never gets off the ground. Notre Dame’s complete wall is in on him and the swarm inundates the pigskin and the lightweight Cadet.” Final, ND 7, Army 6. The two ties at Soldier Field were a 0-0 deadlock with Northwestern in 1931, and a 13-13 final against Great Lakes in 1942. It was another 50 years before the Irish returned to the stadium, when they downed Northwestern 42-7 in 1992. The last visit prior to Saturday was a 42-7 win against the Wildcats in 1994. Chicago’s great edifice will again shine on Saturday night. The spirits of Rockne, the Four Horsemen, and other Irish greats will surround Coach Kelly, Manti Te’o and his mates as they strive to create more ND history in the Windy City.